How "big" is a thought? Nicholson Baker thinks "most are about three feet tall, with the level of complexity of a lawnmower engine, or a cigarette lighter, or those tubes of toothpaste that, by mingling several hidden pastes and gels, create a pleasantly striped product" Perhaps we'd better ask, what makes for a "unit" of thought? Or still better: is there a unit of thought? Is it a concept or a word, or a sentence, a paragraph or a document? Locke would have had no problem saying "yes." It's an idea—most likely a complex idea. In other words, it's something expressed by a word. Others, like Kant, have argued that a thought requires a proposition, judgment or sentence (and that a concept is something like an abbreviated thought). Ranganathan, inventor of faceted systems and the five laws of library science thought that a "document" was an "embodied micro thought" on paper "or other material, fit for physical handling, transport across space, and preservation through time." I myself like Collingwood's idea that "the true 'unit of thought'" is not "the proposition but something more complex in which the proposition served as answer to a question." So for him a thought always presupposes a question and represents an answer to such a question. I would add that such answers usually require more than a sentence, and that at least a paragraph is necessary for anything that approaches "the level of complexity of a lawnmower engine." My paragraphs usually are between 200 and 500 words long. If you need more than a paragraph to answer a question, you probably need more than one thought for the answer. Whether thoughts come in chunks or objective units of meaning, like the seven (or ten) digits that make up a telephone number and knowledge has a granular structure is an entirely different question. I am skeptical about our ability to identify the beginnings and ends of particular thoughts. That skepticism does not imply, however, that we should not try to formulate one thought at a time. 1. If a "unit of thought" presupposes a question, it presupposes other units of thought, whether they be clearly expressed or not. 2. The paragraphs in this blog are therefore not quite representative. Vannevar Bush gets all the credit for having described the Internet or Hypertext before they existed. His 1945 paper "As We May Think" described a desk that allows someone to access information stored on microfilm and to record the "trails" of his research in a way that reminds us of internet searches. Bush thought the machine was mimicking the brain. As Robert A. Fairthorne pointed out in 1958: "The Memex project ... developed ... into the Rapid Selector. The Rapid Selector had probably been realized as a workable device by. E. Goldberg of the Zeiss Company around 1930." He came to the conclusion that Bush's paper was "timely, even though few suggestions were original." Emanuel Goldberg's life and work is described in Michael Keeble Buckland's Emanuel Goldberg and his Knowledge Machine: Information, Invention, and Political Forces (Westport, CT: Libraries Unlimited, 2006). He shows that Goldberg and his achievements became both the victims of National Socialism and the cold war. It is also interesting to note that Goldberg was a student of Wilhelm Ostwald and Wilhelm Wundt. Ostwald was very much interested in improving the way scientific information was transmitted. He was one of the co-founders of the Bridge ("Die Brücke"), the "International Institute for the Organization of Intellectual Work" in 1911. He coined the phrase "brain of the world" (Gehirn der Welt) and thus influenced Wells others. His "principle of the independent use of the individual piece" was not just significant in the history of bibliography. The book is worth a close reading. There is an excerpt at Google books. I just bought for my Kindle: Baron, Dennis (2009) A Better Pencil: Readers, Writers, and the Digital Revolution. Oxford: Oxford University Press. For a review, see American Scientist. I'll let you know what I think in the new year. From the review: "I have to add that my own view of the computer as a writing instrument has always been that it’s not so much a better pencil as a better eraser, allowing me to fix my mistakes and change my mind incessantly, without ever rubbing a hole in the page." First reaction: I think the computer is both "a better pencil" and "a better eraser." The two functions are equally important. But the delete function on the computer adds something important, namely the ability to store what is erased. When I write the final copy of an essay with the word processor, I always create two files, one called "name of essay.rtf" and another one called "scraps for name of essay.rtf." The scraps sometimes come in handy in another context. A versioning system is overkill for my purposes. Furthermore, for the earlier drafts ConnectedText provides automatic versioning, anyway. About a month ago, I gave my iPod Touch to my oldest daughter and bought an Android phone, the Samsung Intercept. I can do everything with this phone that I did with the iPod. In addition, I can also place and receive calls, something I don't do often. I use mNote to synchronize with SimpleNote now. The thing I like most about the phone is that it has a physical keyboard which works better for my aging fingers than the touch keyboard on the iPod. Another thing I like is that I do not have to carry three devices (Kindle, iPod, phone) any longer, but only two. Where Do Bad Ideas Come From? I made a mistake and bought Steven Johnson's Where Good Ideas Come From: The Natural History of Innovation (New York: Penguin Publishing, 2010) for Christmas reading. The central idea of this book is that good ideas are not produced by single geniuses, but by connected networks. He claims: "what you really need to kind of begin with [sic], is this idea that an idea is a network on the most elemental level." Put differently, "ideas are works of bricolage; they’re built out of that detritus. We take the ideas we’ve inherited or that we’ve stumbled across, and we jigger them together into some new shape." Or: "A new idea is a network of cells exploring the adjacent possible of connections that they can make in your mind." In supporting this notion, Johnson uses "Kauffman’s notion of the adjacent possible is the continuum it suggests between natural and man-made systems." The conclusion he "argues" for by producing anecdotal evidence (perhaps better stories) about discoveries in the sciences is that in order to produce good ideas, we should create an environment in which bricolage, slow hunches and serendipity are encouraged. The book ends with a long list of "good ideas," like "World Wide Web (1989-1992)," "Asteroid Extinction (1980)," "MRI (1974)," "VCR (1956)," "GPS (1958)," "Ecosystem (1935)," "Nylon (1937)," etc., etc. These examples take up far too much of the book, as far as I am concerned. They seem to be just filler to get to a respectable number of pages for a book. It's not that I am unsympathetic to Johnson's point of view, but I think his book represents half-baked goods. My main objection to Johnson's "argument" is that he does not show where good ideas come from. At the very most, he shows how any old (new) idea may arise. But for any example of a good idea he gives, one might adduce a bad one, like "Social Darwinism," Fascism," "Nationalism," "Consumerism," "Phrenology," "Eugenics," "Epicycles," etc. And he himself mentions a few bad ones among what he takes to be good ideas, like "Gatling Gun (1861)" and "Motorcycle (1885)." How do these bad ideas arise? In the same way that good ideas arise. The trick, if it is a "trick," is to differentiate between the two. Poincaré's ideas may have arisen in a crowd, but he knew which one's to pick and develop. Johnson makes not the slightest effort to deal with that problem. It would have been good to leave "good" out of the title. Come to think of it, it would have been better for Johnson to have reflected a bit more before publishing these ideas as a book. Johnson's "slow hunch" would have benefited from being slower. I am not sure either that Johnson has even identified the necessary conditions of the possibility of ideas, even though he may have stumbled on some of their sufficient conditions. 1. See Where Do Good Ideas Come From? and An Archipelago of Inspiring Quotes, for instance. 2. Nor is this point identical with the cautionary maxim that we should not discard ideas too early (as being obviously bad). I posted before against the view which opposes everything buckets. Someone at MIT's CSAIL Research project thinks along similar lines and provides an argument why all your data should live in a single file. Needless to say, I agree that the answer is "to build structured data applications where the users themselves define and adapt the structure to meet their own needs." I am not using Haystack for this either. I agree that this is "still predicated on fairly sophisticated users because the authoring process that involves arbitrarily complex data may require comparable complexity in authoring decisions, even if procedural programming skills are not required." What else is new? 1. See Data-Structures are for Programmers. Elephant Dung, that is. Supposedly they are environmentally friendly and odorless! 1. By way of Notizbuchblog. This blog is written by someone who likes (paper) notebooks much more than I do. It also includes entries on the "Notebook Addict of the Week." Addiction is not a good thing, even if it is an addiction to a relatively harmless "substance." I have a hunch, however, that "addiction" is nothing but hyperbole in this context. It's amazing how many different kinds of paper notebooks I don't need. Perhaps too basic for most. But there it is. Noteliner is a minimalist, yet very capable intrinsic (one-pane) outliner, which is actively developed by Sam Hawksworth. It is freeware and can be used for anything from a simple todo list to a complicated writing project. I especially like the drill-down feature that lets you work on a particular "page" or outline level without having to worry about the rest of the structure. It is almost good enough to replace Brainstorm for me, though I am still hoping that something will happen with Brainstorm. Noteliner is definitely worth a try! Alexander Koyré argues in his book From the Closed World to the Infinite Universe (Baltimore: Johns Hopkins, 1956) that it was not so much the "secularization of consciousness" nor the "discovery" of consciousness and subjectivity that are primarily responsible for the radical spiritual revolution that characterized the seventeenth century: They "are concomitants and expressions of a deeper and more fundamental process as the result of which man—as it is sometimes said—lost his place in the world, or, more correctly perhaps, lost the very world in which he was living and about which he was thinking, and had to transform and replace not only his fundamental concepts and attributes, but even the very framework of his thought" (4). The new scientific discoveries and the philosophical reflection on them led to the destruction of "the Cosmos," that is, the idea of the world as a "finite, closed, and hierarchically ordered whole" (4). In the new intellectual world, "common places" that expressed this ordered whole, had no place any longer (no pun intended). This view took a while to "sink in," but by the late eighteenth century it was generally understood. "Commonplacing" came to mean just "placing things under general headings." For most people, however, "common place" became just a word for "trite" and "ordinary," not a useful approach to taking notes. This will be the last time I will belabor this point. Commonplaces My difficulty is that I shall not know what they are until they are finished. Bp. Jebb seems to have known and never to have been surprised by any development of his own thought. This, even more than neatness of handwriting and aptness of quotation, separates him from his successor, who continues his work after an interval of a hundred and twenty one years. Apparently, if he had an idea he could put it down as he had it. But perhaps what he had were not ideas but certified topics that could be carried about intact. I must know what is inside me before I can tell what I am after. Perhaps, if I get through a dozen pages of this book, I shall tell, and my New Ethic result. Each commonplace will be short: how pleasant it would to feel copious as well as fluid! the modern mind takes such small flights." Forster knew the tradition. Commonplaces were indeed "certified topics that could be carried about intact" and they were meant to support writing that was "copious as well as fluid." He "must know what is inside [him] before [he] can tell what [he is] after." For the traditional commonplacer, the commonplace told him what he should be after or after what patterns he should mold his inner and outer life. No wonder Forster soon gave up any pretense at commonplacing and consciously pursued the notebook method. He scraps the "awful" entry by topic and puts down whatever he likes. Samuel Johnson's Dictionary (London, 1805) defines a commonplace book as a "book in which things to be remembered are ranged under general heads." He also lists a verb "to commonplace" which means "to reduce to general heads." Commonplacing is thus a very common activity, according to Johnson. This already reflects a very watered down conception of the "common place," most likely influenced by John Locke's ideas. From antiquity to the Renaissance and early modernity, a common place was a "privileged place," not just any general heading that might or might not be arranged alphabetically. Loci were more like categories in which one searched for knowledge or on which one founded arguments. They usually constituted a kind of system, as I have argued before. 1. See Locke on commonplaces. 2. See also Search for commonplace. Robertson Davies in an Interview with the Paris Review: "I type because writing by hand I find to be a very great betrayer. If you write carefully and try to write legibly, as I do, you finish a page and think, That’s a handsome page. This is absolutely wrong. Also, you can only write so long with a pen before your hand becomes tired, and then your invention begins to tire. If you type, which I do because I had my earliest training as a newspaperman and learned to use the typewriter readily, you have what you’ve written there before you cold and bare. Then you can go over it, and it is as though someone else had written it and you can edit it with great severity. I am a terrible fidget about form, and the first typed draft is often pitifully ragged and messy. But then after it goes to my secretary, who makes a clean copy, I revise extensively. The heavy work is done, but I like revising. As for editing, though I try to be stringent, you will recall that I resist your editorlike zeal for total clarity—all the lights blazing and not a dark corner to be found. I am a writer much given to light and shade, and I firmly believe that to know all is to despise all." In another interview he revealed more about his note-taking or, perhaps better, note-making, and how it shades into writing: "I make a great many notes. I carry a notebook all the time, a book like this, and fill several of them with notes and then I transfer the notes into another book in form of a plan, and I make all kinds of extra notes as the plan develops and then from the plan I write the first draft. And then the first draft requires very, very extensive revision and after a great deal of revision, that's pretty much the book." In the age of computerized note-taking, we have a tendency to neglect this aspect of note-taking, that is, the aspect of working through the notes, revising and rewriting them. This takes time. I used to think that electronic note-taking is of great utility because it saves time and makes one more effective because this process of transferring, revising and cataloguing notes happens without the need for re-writing and copying. I am no longer sure this is a good thing. The Canadian novelist Robertson Davies did not just use notebooks as a literary device in some of his novels. He also kept notebooks of ideas, characters, circumstances and other details. Apparently, he always carried one with him and constantly took notes. As do many people who keep paper notebooks, he numbered the pages. But he went further and gave every entry on a page a number, so that he could refer to it by a combination of numbers and letters: 10A, 24C, 45B and so on. That way he could refer to notes that he later found to belong together, that is, were relevant for a particular character, for instance, in an efficient way. He seems to have viewed the human mind as a kind of "catchall"-notebook. Thus we find in his very first novel: "You like the mind to be a neat machine equipped to work efficiently, if narrowly, and with no extra bits or useless parts. I like the mind to be a dustbin of scraps of brilliant fabric, odd gems, worthless but fascinating curiosities, tinsel, quaint bits of carving, and a reasonable amount of healthy dirt. Shake the machine and it goes out of order; shake the dustbin and it adjusts itself beautifully to its new position." This view seems to be quite independent of his Jungian fantasies which I find quite unpalatable. Hugo von Hofmannsthal said in 1907: "I speak of those who, depending on the different stage of their knowledge, read entirely different books, without any determinate plan, always skipping, seldom resting in one book, driven by a constant longing that is never quite satisfied ... they seek in one book after the other what the content of none of their thousands of books can give them. They seek something that hovers between the contents of all the individual books, something that might connect and unify these contents into one unity. It is the scientist, who can satisfy this longing." Perhaps ... though I believe the metaphysical longing for the one overarching principle of unity in all knowledge is a romantic impulse that will never be satisfied. Nor should it ... perhaps. Call me a skeptic (who else would start and end a paragraph with "perhaps")! From the department of "highly recommended." 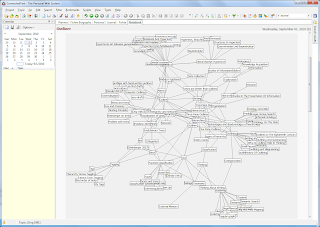 I did not know that Scrivener 2 improved the presentation of notes and footnotes, for instance. I recently read the following comment in the Zotero Forum: "Because I use a very involved annotation system, anything important that I read has to be converted to PDF to support handwritten ink, multicolour highlighter hotkeys, heirarchical [sic] bookmarks, etc. in bluebeam. Currently this is a very involved process ... I would desperately like to simplify this as it acts as a real disincentive for reading!" There is no need of going into the details of this "involved process." The simple advice is to give it up altogether. Annotating source is at best a supplementary or preliminary tool in note-taking. It marks the things you want to take note of, but it is not a substitute for excerpting and reformulating the material in your own words and organizing it in such a way that it will be useful even years later. It represents a rather superficial "surf and collect" attitude that mistakes the accumulation of information for the creation of knowledge. I would not go so far as to call it "epistemologically irresponsible," but it is "epistemologically challenged" because it involves the implicit belief that having marked some things somewhere (in disparate places) amounts already to having made connections between them or that annotating materials is sufficient for thinking about them. Well, it is not. Even such programs as such programs as "Surfulator" represent a better approach to note-taking. They are based on the claim that we need "better ways to collect and manage the worthwhile information we find." This means that we should "permanently save anything you find on the web." While simply "collecting," "managing" and "saving" what one has "found" is rather less than note-taking, it is more than mere annotation. In my experience, students who highlight their textbooks with markers—often with many different colors—often do not as well in exams and papers as they expect to do. In fact, I believe that the money spent on highlighters is money "thrown out of the window." 1. See also Note-taking versus Information-gathering. That's what this blog post suggests. It makes for interesting reading. I have not tried it yet. Here is a very insightful blog on the "Digital Humanities," called "Sapping Attention. Using tools from the 1990s to answer questions from the 1960s about 19th century America." I very much like Clustering isms together, for instance. In any case, I recommend recommend the blog highly. It takes 0.7 mm leads, and it has a cap that is precision engineered. They say: it "is hand-assembled with watchmaker's tools for precision and accuracy." Its "dual-purpose cap provides proper balance while writing and protects writing point when pencil is not in use." 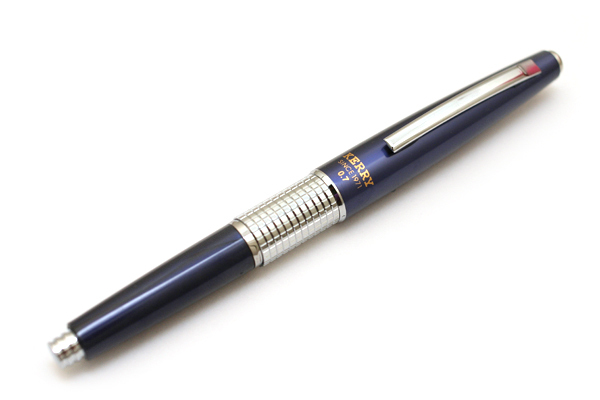 More to the point—no pun intended—it protects your pockets when not in use, while it allows advancing the lead when writing! As I said, I love it (mainly for underlining in books, as I hardly ever write anything by hand anymore). I should probably not admit to the fact that I own two other ones (a black one, also for 0.7, and a red one for 0.5 mm leads). I prefer 0.7 mm. If you want to read more about it, see Dave's Mechanical Pencils . See The DropBox Manual. It makes for interesting reading. In some ways, I have always preferred what is described as "Microsoft’s sync solution." It "doesn’t rely on a central server but instead lets computers sync directly with each other." I recently updated to Live Mesh. The only problem, it does not work with mobile devices such as the iPod Touch or Android. In fact, it does not even work with Microsoft XP (as Live Sync did). So, I use both DropBox and Live Mesh. Trails is a Firefox extension, designed for collecting, editing and organizing fragments of text and images to complement their main application for research. It's meant for quick and easy data collection. The data are stored in small booklets, of which one can create and maintain as many as one needs. It does not require the user to re-structure the research document manually by saving the collected fragments of text and images. The key point of Trails is, however, the ability of transforming combined website fragments (text and images) into printable booklets. If you don't need printed booklets, I would not recommend it. It is a bit cumbersome. 1. This is an edited version of the description of Trails, found at the Website referenced above. Mark Twain: ""Biographies are but the clothes and buttons of the man - the biography of the man himself cannot be written." I just bought another word processor for my German exploits: Papyrus Autor 3.5. It's not to be confused with the word processor included in Papyrus Office 12.5. The first is most definitely German. It includes the famous "Duden Korrektor," a spell, grammar and style checker that is better than anything else I know. The second is (includes) a MS-Word compatible word processor that is also available in English. It is, apart from the German author's tools, the same. But I only bought it mainly for the tightly integrated grammar and style checker. Papyrus Autor shares what is in my view a major flaw with the plain vanilla Papyrus word processor, and this is the lack of automatic conversion of footnotes to and from endnotes. In fact, endnotes, like other references, are stored in a proprietary database. For anyone doing academic work, this is a serious shortcoming, as many publishers insist on endnotes (while some want footnotes). This is why Atlantis remains important to me. It easily allows you to transform the one to the other. My plan is to use Papyrus Author only for polishing the German and Atlantis only in the transformation of ConnectedText's markup to rtf and final copy. I am now about two-thirds done with the first draft of a 350 page German book in ConnectedText, and I have begun to transfer the chapters into rtf. 2. I am using the Beta version of ConnectedText 5 which, by the way, has a very capable German spelling checker and allows for different spell checkers for different projects. This site gives you most everything you need to know about CSS on one (albeit very large) page. I only need CSS to control topics and projects in ConnectedText. Disclaimer: I hope this is not too esoteric. We went to Coolidge Corner yesterday, where I bought a remaindered copy of Paul Auster's Collected Prose. Expanded Edition at the Brookline Booksmith. I already own quite a bit of that prose, but this edition contains "The Story of My Typewriter." Michael Leddy referred to it in the comments a few days ago, and I wanted to read it. The story is about his Olympia Portable. It's "illustrated." I believe that I or, perhaps better, my father owned an Olympia Portable during the sixties. Some traveling salesman had been able to sell it to him because he convinced him that typing "is an important business skill for business people." And this typewriter would allow his sons to acquire that skill and thus become successful in business. So I had to take an evening course, having to carry the damn thing about two miles once a week for a whole summer. I never learned touch typing on it, just because I did not see the point of it and resented having to learn a skill that was only fit "for girls." Nor did it help that all the others in the class were older girls—young women, really— whose interest in me, insofar as they had interests in me at all, were rather "motherly.' They felt sorry for me and gave good advice as to how I could overcome my clumsiness in dealing with the machine. If there had been any chance I would learn how to touch type before they showed their concern, it was completely eradicated afterward. I finally taught myself touch typing on a computer during the late eighties. I never became successful in business, though. Back to Auster: He got his Olympia in 1974 and has been using it ever since. He also tells us that he never made the switch to a computer or word processor because he was told that he could lose all he had written in a session by pressing the wrong button. Too bad. Soon enough, people felt sorry for Auster or rather berated him for not going with the time; and, in a reaction that reminded me of my former self and its allergy to touch typing, he "began to develop a certain affection" for his typewriter. "Until then, I hadn't felt particularly attached to my typewriter. It was simply a tool to do my work, but now that it had become an endangered species, one of the last surviving artifacts of twentieth-century homo scripturus, he came slowly to think of the typewriter as a him, rather than as an it. My former self would have asked: "Why 'him' and not 'her'? The Olympia is after all a German product and the typewriter is known as "Die Schreibmaschine." My present self just does not understand. It has no desire to personalize any machine or tool. I would not even think of my Zettelkasten as a partner in communication, but at most as secondary or working memory. Just read this about Evernote: The company has ambitious plans to be your secondary brain. Literally. As Libin told me, "You will just have a chip in your head, or something. You'll just think about it and there's your external brain; and you'll get things that way." You'll get what? I would not want anyone to have access to my brain. Talk about headaches ... Let's keep it "external." I have blogged about RedNotebook before. There is a new release which "fixes many small issues and adds some minor features. Annotation editing has been improved and simplified. You can now delete annotations with the "DELETE" key. The size of the Windows installer has been reduced and the Windows version now uses a fresh theme and new icons. Additionally RedNotebook has been translated to British English and Norwegian Bokmal." There is an interview with Paul Auster here. Among other things, he talks about his writing implements: "I do have a few unusual writing habits—I'm a dinosaur now. I write everything by hand and type it up on an old manual typewriter, an Olympia 1961 ... I've never been able to compose on a keyboard. I need a pen or a pencil in my hand, feel that it's a very physical activity. When I write, words are literally coming out of my body. And: "I'm very particular about my notebooks, and 95 percent of the time they are the same kind of notebook: They're made in France and are very tall—Clairefontaine brand, 24 x 32 centimeters. They're filled with pages of graph paper, which I like, as my handwriting is rather small." You knew this, at least since Oracle Night, didn't you? And: "I tend to buy notebooks whenever I travel. I have Norwegian notebooks, Japanese notebooks, Australian notebooks. I write with a fountain pen, and over the years I've experimented with many different kinds of fountain pens, but for the past decade or so I've been using an Italian brand called Aurora. I do write with pencils, too, and those are always Pentel mechanical pencils with 0.5 leads. I told you I have small handwriting!" These quotations do not make for the most important parts of this interview, of course. But I must say that I am a bit surprised by the fact that he has not taken at all to the computer. In fact, for some reason, he was the last writer from whom I would have expected this. It's just more (anecdotal) evidence for my theory that in writing there is much less of a relationship between the tools you use in writing and the output you create than some people would like to believe. Making a List is a review of To-Do List by Sasha Cagen (Simon and Schuster, New York, 2007). But it also offers reflections that are worthy of being pursued further. This does not mean I agree with the reviewer. To say that "List-writing ... embodies a paradigm shift" because (?) the "reincarnation of the list bears a striking semblance to a simplified weblog" seems to me a bit much. Lists are the oldest and most basic form of making sense of disparate information. They remain, even in their electronic form, very limited tools. But this does not mean they are unimportant or not worth thinking about further. 1. See also Umberto Eco on Lists and Sontag on Lists and Collections. . I am in the market for a new one. The old one I had bought from Levenger, which was annoying because it collapsed almost every time you turned a page, fell to the floor again and broke. There is a new version of txt2tags. The most important new feature as far as I am concerned is the conversion to Wiki Creole, which is very, very close to ConnectedText. 1. See also this post. Outliners represent a particular version of nesting, where "nesting" means that we place one thing "under" or "in" something else. You can also say that it nests lists under other lists. There is a hierarchical relationship. Usually one nests the simple in the complex or the particular under the general (though one may also take the reverse approach. In any case, a "parent" can have "child," and a child can have a grandchild, but the grandchild cannot in turn become the parent. There is always a "root" and you can think of this classification scheme as a "tree." Brainstorm is a simple nesting or list editor, for instance. It allows you to look at a particular list without worrying about the list that comes before and after. But every list has a definite place in a hierarchy of lists. Brainstorm has "namesakes." 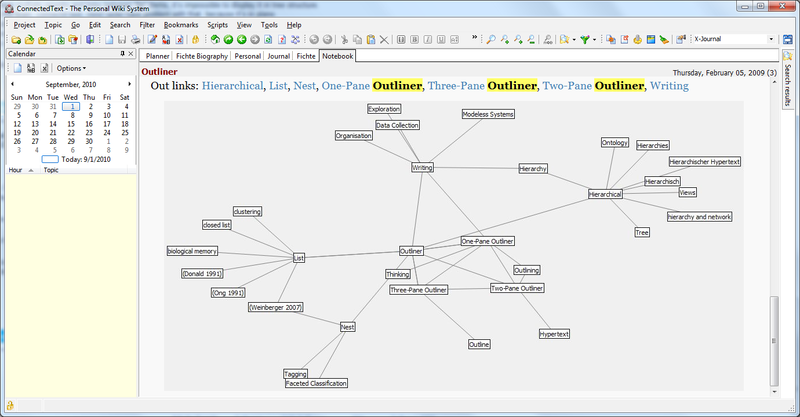 Namesakes are any entries in a BrainStorm model with identical text. They are created automatically but you can disconnect them if you want to. They enable you to see when you've already entered or pasted something. This allows you to have the same information at different levels of the lists, but it is a rather limited way of circumventing the hierarchical structure. A true outliner is even more hierarchical. It is a system of nested groups. Hierarchies are good because they group related things. A collapsible outliner is useful because it allows you to hide as much or as little of the gory details as you want But, and this is important, traversing from one point in the hierarchy to another must always move through a common node or root, and this route can be very long in a complicated outline. A wiki represents a network. In a network there need not be a root (though you can, if you want) create a hierarchical network as well. Any point or node of the network can be connected to any other. A parent can thus be also the and at the same time the child. There is no direction, unless you restrict yourself and impose one. In any case, what makes the wiki interesting is that it is not a tree (and not an outline). So you could say that a wiki (or network) can take a hierarchical structure, but you cannot say that a hierarchical structure can be, insofar as it is a hierarchical structure, is a wiki or a network. That is why outliners are usually opposed to networks. And that is why I think it is nonsense to speak of Word's Outliner as a "nested wiki." See also Hierarchies and Nets and Outlines and Hypertext. To say it again, I have nothing against hierarchical outliners and I think it is wrong to think that it forces us into "hierarchical thinking," but I see no advantage to confuse two things that should be kept separate. I should also say that I do not want to claim that the fact that I do not like MS-Word's outliner has any strong normative force. so, if you like Word's, and if you do not need a wiki that's fine with me. Just don't call it a wiki because it fulfills the same function for you, for which others use a wiki. 1. I like outliners. I also know that some of the better outliners try to incorporate network-like capabilities. It's just that MS-Word's outliner does not do this in any way whatsoever. That MS-Word also allows you to include links to other files and thus to mimic rudimentary wiki-like capabilities in this way is true, but it is also a rather different matter from collapsible outlines. From the department of nonsense: Use Word's Outline View as a Nested Personal Wiki. "Rather than keep multiple files, to-do lists, and longer notes on something coming up, consider using a Word file in the "Outline View" to create a nested, expandable personal wiki-style organizer." I get that it is one file. I also get that this one file is an outline (which has collapsible and expandable levels, as all outliners do). I also get the personal and expandable part. I don't get what would make this a "wiki -style organizer." This characteisation of a simple word outline amounts to willful obfuscation. It has absolutely nothing to do with a wiki. This in itself does not make it a bad idea. Just as a car might not be a bad idea, calling it a "boat" certainly is. I like outliners and I like wikis. I am very interested in how they can (or cannot) be combined. This entry says absolutely nothing about this issue—or anything that would be intrinsically interesting to anyone. Doesn't everyone already know that the MS-Word Outline, like any outliner, can be used for to-do lists, and longer notes? and why use MS-Word's clunky outlining feature at that? Both install from Zip Files. Notational Velocity's Zip File is 1.6 MB, ResophNotes is 7.2 MB. Apparently Notational Velocity is 4.1MB on disk; ResophNotes is just 0.708 MB on disk, but if you look at the entire folder it's 16.4 MB. Seems like a clear advantage for Notational velocity, even though it is of course tricky to compare file sizes on different OS's. The general layout is similar, though Resophnotes does not show the dates viewer as Notational Velocity does. Some view this as a shortcoming. I don't, but I will deduct two points. On the other hand, ResphNotes has tags, which Notational Velocity has not. This seems to me worth at least three points. Both are minimal. You need to press Ctrl-N to write a new note and cannot just start typing in the search box. I like this better, but I will keep the points the same. Notational Velocity allows formatting (bold, italics, underline). ResophNotes doesn't (because it is a plain text application). I would not call this a shortcoming as I use wiki-formatting to format (//,**,__) and almost everything ultimately ends up in ConnectedText, but others would most certainly look at it as a short-coming (-1). On the other hand, ResophNotes accepts Markdown, which can be translated into HTML and viewed in ResphNotes itself (and copied and pasted into an application capable of rtf (formatting remains) (+1). ResphNotes also allows you to e-mail a note. ResophNotes does not encrypt—not important to me, but it may be important to others (-1). Notational Velocity gets 7.3/10, ResophNotes also gets 7.3/10. As I said at the beginning, I know I am comparing Apple and PC applications (and if you have not realized by now that my tongue is firmly in my cheek, you have missed something). Modeless Operation: Searching for notes is not a separate action; rather, it is the primary interface. Mouseless Interaction: The window was designed for keyboard input above all else, and thus has no buttons. Data Instead of Documents: There is no manual “saving” in Notational Velocity; all modifications take effect immediately. and, most importantly, both sync with SimpleNote. This is a comparative review of Notational Velocity and Nottingham. Notational Velocity wins 5-1. Seems fair to me, if only because Nottingham for the most part just "copies" the freeware application Notational Velocity and then charges $19.95. 1. See also Notational Velocity and Nottingham. You can get the beta version of Scrivener for Windows here. I downloaded it last night (which was difficult, due—I suppose—to the heavy volume of people downloading it. ConnectedText does everything I want out of a writing program. Scrivener does not do a thing more that I would really want, even it it looks pretty. I hope I am not unfair, because it is just a first beta. In any case, I might change my mind on it and consider it a worthy companion to ConnectedText, sort of like many people on the Mac work with a combo of DevonThink (or TinderBox) and Scrivener. I just don't see it at the moment! In a short essay, Paul Graham talks about what he calls an ambient thought or "the top idea in your mind." As he observes, everyone who has "worked on difficult problems is probably familiar with the phenomenon of working hard to figure something out, failing, and then suddenly seeing the answer a bit later while doing something else. There's a kind of thinking you do without trying to. I'm increasingly convinced this type of thinking is not merely helpful in solving hard problems, but necessary. The tricky part is, you can only control it indirectly." "you can only control it indirectly"
I have posted about this before in Planning for Unexpected Discoveries, for instance. But it appears to me that for those of us who (must) spend time thinking and writing, there is nothing better than regular writing sessions to enforce control over what is the top idea in our minds. See also The Rule of 200 and Writing Advice. This is how you can indirectly control your ideas and their flow. But see also Sleeping and Making Connections. ResophNotes; press +^R, ^N (for a new note); I use it for quick notes that I write down so as to not to break my concentration, saving the entries as text files in a directory. Resophnotes syncs its files on all my computers and can be easily imported into ConnectedText (in fact, since I only import from it, all I have to do is to select Project/Import and press Enter. 1. ResophNotes can be used as a front end for Simplenote on a PC. So it also gives you access to notes you make on your iPod. 2. ResophNotes thus also replaces the AutoHotkey script I wrote about in Self-Control. This project "was registered on SourceForge.net on Oct 17, 2010, and ... described by the project team as follows: Wikiexe is a simple, easy to use, light desktop wiki. It's designed to use MediaWiki skin, syntax (small subset) and xml export format." It sounded interesting enough. I downloaded it in order to try it out, but it never even started on my machine (Windows 7, 64 bit), so I had to uninstall it without trying it. It's clearly not ready. So I keep wondering how small the subset of MediaWiki formatting really is. DeLillo on the threat of the electronic form: "The world is becoming increasingly customized, altered to individual specifications. This shrinking context will necessarily change the language that people speak, write, and read. Here’s a stray question (or a metaphysical leap): Will language have the same depth and richness in electronic form that it can reach on the printed page? Does the beauty and variability of our language depend to an important degree on the medium that carries the words? Does poetry need paper?" He does not answer the question, but in asking it, he suggests not only that the question makes sense, but also that possible answers need to take into account some sort of "shrinking" in the beauty and variability of "our" language. I think it is, as one used to say during the time I was (un)fortunate enough to be a graduate student of philosophy, a "pseudo-question." If poetry really needs paper, turn on your laser printer (or, if you must, your inkjet)! And ... no I don't think that electronic media will kill print. I do collect mechanical pencils, even though I do most of my writing "electronically." 1. "Individual specification" is not necessarily bad. When I go out to eat, I do not go to MacDonald's (and just because it does not cater to a "shrunken" context). I like to go to go to a restaurant that targets a smaller segment of the population, i.e. people who share my tastes. I also thought I was reading DeLillo and Markson because they were reflective in ways most people who speak, write, and read are not. There is a topic on Alphasmart in the Scrivener Forum. By the way, Umlaute created with the compose feature on an Alphasmart with an English keyboard, show up as gibberish when "sent" to an application on the PC (and the Mac, I would suppose). They show up correctly when the files are transferred with the Neo Manager (which also works with Windows 7 (64 bit). Scrivener for Windows is supposed to be released on the 25th of October. 1. I use ";a", ";A", etc. in AutoHotkey to produce "ä", "Ä", etc. on the PC. If I use ";a", ";A", etc. in an Alphasmart file and then send it to an application, the Umlaute also get translated properly by AutoHotkey. I prefer this solution, as it is quicker and more convenient. The Horror of the "Everything Bucket"
See Avoid the Everything Bucket for a revival of some interesting confusions about "buckets," applications, proprietary data, hierarchical file structure, etc. The items are listed in the order of importance to my needs. The Windows 64 version runs faster on my machine, and the UTF-16 support makes things easier in relation to ConnectedText. I will have to learn how to use COM and objects, but I will try. All the scripts I had written for the old version seem to work. I only had to disable some lines, like "Transform Clipboard, Unicode, %UC%" that were needed for ConnectedText (and are now moot). From the Kindle Website: "The 'My Clippings' file contains all of the bookmarks, highlights, notes, and clippings ... made while reading on Kindle ... The contents of the "My Clippings" file are available to read later or to copy to your computer ... The "My Clippings" file is ... a TXT file ..."
"All ... notes are also automatically backed up on Amazon servers ... Note that your 'My Clippings' file is not stored on Your Media Library." This holds only for books purchased from Amazon. Notes from free books obtained elsewhere (like www.gutenberg.org) will not show up. Most importantly, perhaps: "On most books, you may clip up to 10% of the total text ... If you reach the clipping limit, although your highlights will continue to be marked in the book itself, the highlighted sections will no longer be added separately to your 'My Clippings" file.'" All notes—that is even those from books not received through Amazon—show up here. I have seen complaints about the last restriction as an unreasonable undisclosed limit of the Kindle. It is neither (or so it seems to me). The limit is disclosed (at least at his time), and 10% seems reasonable. I wonder how many of us wrote down in long-hand or type writer more than 10% of a book as notes. For a 250 page book, 10% amounts to between 35 and 50 (double-spaced) type-written pages. Mind you, there are two or three books on which I took that many notes over the years ... but you would probably want to own the print version of such books anyway. When note-taking is made easy by electronic means we tend to take more notes than necessary and to think less about why we take them. This is not new. I have made many photocopies of complete articles that did not do me much good either. Personal Notepad is an e-book designed just for notes. Pretty primitive, but it works. There are other interesting articles on the EduKindle site. Notescraper exports your Kindle Notes into Evernote. It uses the Amazon.com Website to get the notes and works only on the Mac. I broke down and bought a Kindle 3 (Wifi). I found $139 was just a little below the pain threshold that kept me from buying earlier versions. It is pretty good. It's thin, and the screen is very readable. So far I like it. And I am glad I waited. So far, I read one book on it, which I did not like: Albert Laszlo Barabasi (2010) Bursts: The Hidden Pattern Behind Everything We Do. I bought it because I had very much liked Linked: How Everything Is Connected to Everything Else and What It Means (2003). Don't buy this one, unless you interested in 16th-century Hungarian history, with which every second chapter deals. Nor do these history chapters have any deep connection with the purported topic. They just dilute the discussion of what is promised by the title. And the thesis that many events in the natural worlds follow—including our own lives—exhibit a power law distribution or tendency to cluster into "bursts," is rather underdeveloped (or so it seems to me). The whole book is thoroughly underwhelming. Thus I found vaguely interesting but unsurprising the idea that "we are forced to set priorities—even the greats, Einstein and Darwin, are not exempt—from which delays, bursts, and power laws are bound to emerge," and "if we set priorities, our response time becomes rather uneven, which means that most tasks are promptly executed and a few will have to wait forever." The GTD crowd has been preaching this for a long, long time ... and what this book brings to bear on this phenomenon is very little. However, what I found interesting in reading this book on a physical Kindle is that the Kindle stores highlighted passages and notes that you can add yourself in a text file, called "My clippings.txt." Since the Kindle looks to the PC like an ordinary an ordinary USB drive. You can open this file in other applications, edit it, move it to the desktop, send it to someone, etc. I wonder whether this is useful. we display a ceaseless desire to move most of the time. We are not kicked by tiny, invisible atoms but dragged by the imperceptible flickering of our neurons, which we translate into tasks, responsibilities, and motivations. I just copy the contents into a ConnectedText topic for the book and transform "==========" into "----". There is no reason why you could not use the book (any book) for notes that have nothing to do with the book you are reading at the moment, like reminders, todo items, or bright ideas. This is why I don't quite understand the attraction of using the built-in experimental web browser for text editing, as some suggest. One can use Mytextfile for such purposes, but it seems to me much more convenient to use "My clippings.txt." For those who are interested. Using the "keyboard" on the Kindle 3 is at least as easy, if not easier than, using the virtual keyboard on the iPod Touch. It isn't suited for heavy-duty writing, but it will do in a pinch. 1. Neither the PC version of Kindle nor the iPod Touch (software) versions allow you to do this. Just for the record, I have bought and read about ten books on the PC or iPod Touch. The experience on the real thing is preferable. These tips from the Columbia University Graduate School of Arts and Sciences deserve to be heeded by undergraduates as well. Indeed, they are useful to anyone who needs or wants to write. From the first installment: "Writing everyday contributes to continuity of your thinking and generating the ideas you need to write. Your mind will function differently when you write every day. We all think about our writing every day. But the cognitive processes involved in writing are different from those involved in thinking. Your project moves forward when you write…even if you write a gosh-awful first draft. (The topic of our third posting is the necessity of writing a crappy first draft.)" 1. See also The Rule of 200. "I first make the rudest outline in two or three pages, and then a larger one in several pages, a few words or one word standing for a whole discussion or series of facts. Each one of these headings is again enlarged and often transferred before I begin to write in extenso." 1. see also The Method of Darwin's Notebooks, Darwin's Notebooks on the Internet, Darwin on collecting Notes. Here is an interesting video from Steven Johnson. Parts of the answer: "connectivity" and serendipity. Whose Distraction is it anyway? See Introducing “ū—”: A Distraction-Free Writing Environment for an answer. For added enjoyment, you should perhaps first take a look at this: The key to good writing is not that magical glass of Bordeaux, the right kind of tobacco or that groovy background music. The key is focus. But be sure to read to the end, for otherwise you are going to miss some exquisite pretentiousness of the German kind, like: "The original title was 'Writing Machine', a literal translation of the German 'Schreibmaschine' which means 'type writer.' But, alas, “Writing Machine' is too long for iOS. More importantly, 'Writing Machine' suggests some sort of artificial intelligence that writes for you, which is exactly the contrary of what a good writing tool does ..."
The name of an application called "Writer" does, of course, suggest that you do the writing, or does it? Yes, Virginia, there is going to be Scrivener for Windows. Looks interesting. I know that many people have been looking forward to this. From the blog of the original developer: "The Windows version has actually been in (secret) development for the past two years, but it is a completely separate development effort by another developer who has now thrown his lot in with L&L. Lee Powell was a Mac user of Scrivener who approached us back in 2008 wanting to create a Windows version, and his enthusiasm for Scrivener and writing made it too good an offer to pass up." Public Beta is supposed to be out by the end of October, if I understand correctly. 1. 7:50 PM: Actually, I can't help myself. I have to make at least one comment. The developer aims at the end of October for the release of the Beta because then it will appear "just in time for NaNoWriMo." And everyone who participates "and achieves their 50,000 words (and has them validated)" will get a 50% rebate on the final price ($40.00). As if they were not already too many bad novels ... I sincerely hope all the novelistic nonsense can be turned off in the final application. See also Writer's Café. I referred to a review of Scrivener in the Chronicle of Higher Education earlier. They have just published a review of an application, called "Writer's Cafe", which is available for both Windows and the Mac. (It's also available for Linux.) The review is on the whole positive. The reviewer finds, for instance, "Writer's Cafe is intended as a fiction writing tool, but you can also use it for other types of writing. Indeed, the naming convention used throughout the program refers to storytelling: storylines, screenplay formatting, character development, and there's even a "name generator" for characters. If you can move past these conventions, Writer's Cafe becomes useful for project-based writing." I have never been able to get past the naming conventions (and I do not understand why they are hard-coded into the program). Even the name is overly pretentious (if that isn't a pleonasm). As a result, I have never given this program a thorough trial. I have seriously tried yWriter which is less visual but otherwise quite similar, and the "fiction metaphor" drove me bonkers. I don't want to create the (slightest) appearance of writing a novel—even to myself. So I will stick with ConnectedText as my Scrivener for Windows. It's much less pretentious and much more flexible. The Boston Globe has published an article on Lost libraries. The strange afterlife of authors’ book collections. Interesting! The most significant author's library in the Boston area (I know) is the Stone Library of the family of John Quincy Adams in Quincy. As a historian of Philosophy, I have had to live with that approach pretty much all of my life. Much of "analytic" and "post-analytic" philosophy lives off this kind of "proofiness," albeit more based on logic and semantics. Is it a mere accident that it rhymes with "goofiness"? I will have to get this book, in any case! Wittgenstein remarked in the Preface to Philosophical Investigations "I have written down all these thoughts as remarks, short paragraphs, of which there is sometimes a fairly long chain about the same subject, while I sometimes make a sudden change, jumping from one topic to another.—It was my intention at first to bring all this together in a book whose form I pictured differently at different times. But the essential thing was that the thoughts should proceed from one subject to another in a natural order and without breaks." And: "After several unsuccessful attempt to weld my result together in such a whole, I realized that I should never succeed. The best that I could write would never be more than philosophical remarks; my thoughts were soon crippled if I tried to force them on in any single direction against their natural inclination.—and this was, of course, connected with the very nature of the investigation. For this compels us to travel over a wide field of thought cris-cross in every direction." Wittgenstein had typed up these notes, cut them up, and clipped some of them together again with staples to "achieve" this purpose. In another context, he confessed: "Each of the sentences I write is trying to say the whole thing, i.e. the same thing over and over again; it is as though they were all simply views of one object seen from different angles." So much for the supposed hypertextual deep-structure of his thinking! 1. See also Wittgenstein "on" Note-Taking and Long-Hand and Type-Written. 2. Compare Nabokov's approach. He also "saw" the whole thing and used short clips, i.e. index cards, to record it. Yet, he was not so "vermessen" or daring to think that one sentence could say the whole thing. Robert J. Sawyer has argued that there were "two basic metaphors for pre-computer writing," namely, "the long-hand manuscript page" and the "typewritten page." I will call them the long-hand and the type writer metaphors respectively. These metaphors were adopted in various ways by the makers of word processors. Sawyer claims that most word processors emulate the the type writer, while some, most notably Wordstar, try to emulate long-hand. What do the two metaphors amount to, according to Sawyers? He says: "On a long-hand page, you can jump back and forth in your document with ease. You can put in bookmarks, either actual paper ones, or just fingers slipped into the middle of the manuscript stack. You can annotate the manuscript for yourself with comments like "Fix this!" or "Don't forget to check these facts" without there being any possibility of you missing them when you next work on the document. And you can mark a block, either by circling it with your pen, or by physically cutting it out, without necessarily having to do anything with it right away. The entire document is your workspace ... On a typewritten page, on the other hand, you are forced to deal with the next sequential character. Your thoughts are focussed serially on the typing of the document. If you're in the middle of a line halfway down page 7, your only easy option is to continue on that line. To go backwards to check something is difficult, to put in a comment that won't show when your document is read by somebody else is impossible, and so on. Typing is a top-down, linear process, not at all conducive to the intuitive, leaping-here-and-there kind of thought human beings are good at." This sounds plausible on a first read. Hell, it sounded plausible to me even on a second read. But when I thought about how I actually wrote with a type writer, it became apparent to me that this is superficial. Whe you write a page with a type writer, you are indeed forced to focus on the next character, or next word you type. But the very same same is true about long-hand. While actually writing you must concentrate on the next character, next word, next sentence. Both ways of writing are equally sequential or linear. It is also false that you cannot write series of unconnected notes. You can, and to do so, many people wrote their first (or second) drafts on index cards which were conducive to what he calls the "intuitive, leaping-here-and-there kind of thought human beings are good at." If you take a look at what Sawyers compares, you see it is actually not writing down letters and words in long-hand or with a type writer, but rather revising a long-hand document and simply typing on a type writer. This is not fair. It amounts to comparing things that are at different ends of the same continuum. So how did we revise the type-written page? Well, we struck out words and sentences, wrote new ones in the margins or above the struck out line, annoted [sic] the text with comments like "Fix this," "Expand!" etc. Stapled half a page or a paragraph that we wrote to the original page, marked it up by circling or underlining. Sometimes we even cut up the manuscript and glued it together in a new order. Ultimately, it had to be re-typed, just as a long-hand manuscript would have to be re-written. As far as revising went, there really were no significant differences. And even as far as writing went, there were few. I have seen manuscripts of novels, in which the author struck out things, typed between lines, etc., right on the type-written page. For this reason, the conclusion is unwarranted: "a word processor that uses the typewriter metaphor — WordPerfect is one — might be ideal for low-level secretarial work: proceeding top-down through a document that has been created in content and structure by somebody else. But for one who must start with absolutely nothing and create, from scratch, a coherent document with complex and subtle structures, the long-hand-page metaphor is the way to go." Since there is no fundamental difference between the two metaphors, they cannot lead to such fundamental different applications. This is also apparent from such metaphors as "cut and paste," for instance, which comes mainly (but not exclusively) from the age of type-writers. .. check the length of Jupiter's year"
Well, any word processor allows you to enter anywhere something like "###" to write ###check the length of Jupiter's year###, and "###" is easily searched for, as it does not occur naturally in many texts. Most other things he talks about have "work-arounds" like this. What does this show? We fall in love with our tools. Some of us do not reflect on what we are doing, some of us do. This may lead to quite different ways of using these tools. Some of us use our word processors for "low-level secretarial work," some of us use it for "the intuitive, leaping-here-and-there kind of thought human beings are good at." I actually think there are better tools for the second kind of work, but that is another matter that has little to do with the myth of the fundamental difference between long-hand and type-written pages. 1. He claims himself: "Writing and revising are a continuum," yet he uses the two extremes of this continuum to argue for a (radical) discontinuity between the long-hand and typewriter approach. Write&Set, according to its author, is a full-featured word processing program with hyphenation, contents creation, footnotes, index, embedding graphics and a lot of more. It is an alternative concept of word processing for people who don't like Winword-like programs. Shareware." This leaves out the most important aspect of the appeal it has for some. It is a program that emulates WordStar. One of the things that makes it different from Wordstar is that editing and formatting are done in separate programs, called WSedit and WSformat respectively. The first is freeware, the second shareware. The programs work thus very much like Tex, which itself seems to have its roots in Unix, where once upon a time text was written in vi and then formatted for printing with nroff. "Write&Set uses the Wordstar 4.0 file format. Write&Set also reads Wordstar 5-7 files, but always saves Wordstar 4 format. (The Wordstar 4 file format does not use the 'symmetrical sequences' of Wordstar 5-7.)" I played with WSedit and found it very interesting. Its way of formatting reminds me very much of lightweight markup languages or a wiki format like ConnectedText. Since it really does not provide any functionality that would go beyond such markup languages, I would not go back to it, however. While I remembered some of the CTRL-commands, I had completely forgotten about the block and dot commands. Wordstar 3.x was not the first word processor I used, but it was the first word processor I used to write a book. It was a DOS application, did not have automatic footnoting, and had no WYSYWIG capabilites, but it worked well. I abandoned it for MS-Word after I finished the book because it had these capabilities. Believe it or not, there are still some people using Wordstar today. One of the best articles singing the praises of Wordstar is Wordstar: A Writer's Word Processor by Robert J. Sawyer. His main reasons for liking it are (i) it's good for touch typists, and (ii) it uses what he calls the "long-hand metaphor." Sawyer argues there are "two basic metaphors for pre-computer writing. One is the long-hand manuscript page. The other is the typewritten page. Most word processors have decided to emulate the second — and, at first glance, that would seem to be the logical one to adopt." Yet, he thinks the long-hand metaphor is better for writing. Instead of having to focus on the next character, you can jump around, mark up and edit the document at will. The two metaphors are, of course not mutually exclusive, but they certainly do make a difference. The article repays careful reading—or so I believe. 1. For a description, see this Wikipedia article. In Defense of Links presents an argument against some of the claims made by Carr in The Shallows. "Links have become an essential part of how I write, and also part of how I read." This also characterizes an important aspect of my reading, writing and thinking. I even like the picture! 1. Even if this has for me little to do with "The Web" but with private note-taking. I read today: "Borders book retail chain suffers sales fall." This reminded me of my last visit to the local "Borders." The store seemed empty, so many shelves had been removed from it. There were not many customers either. The shelves that remained were full of books that I could have bought anywhere else. But most of the books I would not have bought in any case. Any section that would have interested me was no longer there. Hardly any "Philosophy," but lots of crappy "Metaphysics" and an excess of "Religion" and "Christianity." I had long given up of finding any book by Sebald, though two years ago they actually stocked some of his novels. I asked myself what I was doing in this place and vowed not to come back. In the article they blamed Electronic Books for the downturn. I think they have next to nothing to do with the real problem. Borders' sales are falling because they are not stocking enough books of the kind that people like me were buying and would continue to buy. If people find no reason to go to the bookstores, they will a fortiori not buy anything there. I am not sure that this downward spiral can be reversed. It is not that Barnes and Nobles is any better. When I visited last week the University Bookstore of Boston University, I saw that the Fiction section was downsized, and that "Romance" took up the first row. "Philosophy " was cut in half, "Spirituality" doubled. This is another bookstore I will avoid from now on. Luckily, Cambridge and Harvard Books is not that far away. 1. It's created by an expression like this: "[[$GRAPH:(($CURRENTTOPIC))|Height=500|Width=1000|Levels=2]]". It resides in the footer of every page (note) I create. Here is a nice post on password strength. The difference made by the number of characters to the time it would take to crack a password is truly amazing. Addendum or another comment at Wednesday, September 01, 2010, 8:45 PM: It has been pointed out to me by a friend (who is flattering me by reading my posts) that I "misstate" the point of the blog post I am linking to: The times it takes to crack a password comes from a LifeHacker article that this post is disputing. I am not sure that I misstate the point of the blog entry because I don't say anything about what its point is. The the blog post does not raise any doubts about the mathematics on which the the time estimates are based. Perhaps the mathematical ratio by which the times increase is simple-minded, but "all the duration ratios in the table make sense." That's what interested me. The post does raise doubts, however, about how this applies to actual cracking programs (the ratios don't "explain how password cracking programs actually work.") Depending on what algorithms a cracking program uses, even a shorter password might take longer to crack than the table predicts, etc. So, there are questions "which are a hell of a lot more interesting than raising 26 to a variety of powers." Agreed! Bookshelfporn is a site that posts just pictures of bookshelves. For those interested in bookshelves from the historical and the engineering perspectives, I recommend: Petroski, Henry (1999) The Book on the Book Shelf. New York: Alfred A. Knopf. Not quite as good as his The Pencil. A History of Design and Circumstance (New York: Alfred Knopf, 1999), but still very good. Synapsen " is a hypertextual card index or reference organizer, which is to say a storage system on the basis of an electronic literature database that enables the management of bibliographies ... synapsen offers a very distinct advantage: with catchwords [keywords, MK] entered by the user, the program connects individual cards automatically and creates not only a network of cards whose relation to each other might have been forgotten, but also creates completely unexpected connections and relations between individual entries." It is in some ways similar to Daniel Lüdecke's Zettelkasten, which has seen much more development during the last few years, however. Synapsen is also described by the developer as "a hypertextual card catalog or reference management software written in JAVA." 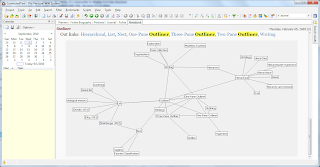 It uses an a "SQL-database based in [sic] the literature networking structure [sic] from [sic] Niklas Luhmann." As I have said before, Luhmann's Zettelkasten did not primarily (nor even secondarily) rely on connections by means of keywords. It was based on direct connections of Zettel or index cards to one another (based on a numbering scheme). It was thus much more similar to a Wiki, like ConnectedText. 1. It now allows direct manual links between entries, by the way. I am slowly getting tired of the constant din of Apple converts and fan boys whose refrain is "Apple is the better ..."
Today I read on some Website how someone commented with adulation on "Apple’s core value:" "We believe that people with passion, can change the world for the better." Quite apart from the fact that such a belief is not necessarily a value, it is a trite (and somewhat stupid) advertising ploy. Passion always makes a difference—and usually not for the better. What about: "We believe that people with passion, can change the world for the worse"? Adolf Hitler certainly had passion. Or what about: "We believe that people with passion, can change the bottom line of the balance sheet for the better"? There is no difference between Steve Jobs and Bill Gates in this regard. Even if Apple has at the moment the better designed interfaces, even if Apple is more stylish, and even if it has more appeal to the trendy, it is for that reason no better than any other company out to fleece us of our money. It is only more effective at it. It is one thing to like or even love the product. It is quite another to adore the producer or the supplier who might, for all I know, be rotten to the core (just as most big corporations I have had to deal with). I guess in the summer or on sabbatical it should be more like 1000 words or more (plus the research that allows you to write these words). ResophNotes sports Internal Links. Enclosing any word or words with square brackets, creates a link to a topic with that name. If the topic exists, it links to the existing topic. If the topic does not exist, you are asked whether you want to create it. Clicking O.K. does create it. It's like a very simple wiki, though deleting a just created topic does not remove the link (nor does it change it back to look like a potential link). But it's obviously not meant to reproduce all wiki capabilities. Notetab, for instance, behaves very much like this. Still, I would say that this feature puts ResophNotes heads and shoulders above Notational Velocity and Nottingham. It's an example of a PC applications that has become in a short much better than anything available for the Mac! I'd just wish someone would do this for a simple Outliner. 1. Wednesday, August 18, 2010: See also ResophNotes and ResophNotes 1.4. Ernst Jünger extensively used card indexes. Among others, he had one, in which he collected "last words" of famous and not so famous people. He also collected words that are synonymous with or similar to "hand." Weird ... but perhaps no weirder than collecting passages about fog, as Umberto Eco did. They end up in one of his novels, where he conceives of a character that collects them. Paul Celan collected words in different language for "Herbstzeitlose," and many other authors just collected "beautiful passages." There are collections that are even stranger (and more difficult to store). Ernst Jünger: "The degree to which a certain topic occupies us is proportionate to an increase in connections. It is as if we had knocked at a door that leads to a panorama of ideas." Taking note of a concept, idea or topic means also—perhaps even primarily—to notice its connections to other concepts, ideas or topics. I think this is right, even if it was Ernst Jünger who said it. If you go to the SimpleNote Page, you get an ominous: "we'll be back soon..."
It's only on their blog site that you find out: We should have mentioned: all is OK. All is great, actually. And all syncing services are still online. Our temporary absence from the App Store is merely the result of an unexpected complication with the forthcoming major update. I went to the site because I read somewhere that Simperium is not to be trusted and might go away. Baloney ... though it might have been a good thing to include the information given in the blog entry on the Website itself. I once had a pencil which would write only brilliant sentences. Trouble was ... it did not allow me to write anything at all (in either German or English). So I threw it away. I haven't had much trouble with writing since then. Keith Thomas on Historical "Method"
"When I go to libraries or archives, I make notes in a continuous form on sheets of paper, entering the page number and abbreviated title of the source opposite each excerpted passage. When I get home, I copy the bibliographical details of the works I have consulted into an alphabeticised index book, so that I can cite them in my footnotes. I then cut up each sheet with a pair of scissors. The resulting fragments are of varying size, depending on the length of the passage transcribed. These sliced-up pieces of paper pile up on the floor. Periodically, I file them away in old envelopes, devoting a separate envelope to each topic. Along with them go newspaper cuttings, lists of relevant books and articles yet to be read, and notes on anything else which might be helpful when it comes to thinking about the topic more analytically. If the notes on a particular topic are especially voluminous, I put them in a box file or a cardboard container or a drawer in a desk. I also keep an index of the topics on which I have an envelope or a file. The envelopes run into thousands." The old "envelope" filing system ... not the most efficient, as far as I am concerned. For more "enlightenment" on the methods of some historians, see Thomas' Diary. I just came across this site. It contains the translation of the first five pages of Thomas Bernhard's novella, Walking. The first sentence (which is also the first paragraph) is memorable: "There is a constant tug-of-war going on between all the possibilities of human thought and all the possibilities of a human mind's sensitivity, and between all the possibilities of human character." I recommend it, even though Bernhard's style takes more than some getting used to ... Definitely not recommended as a source for patchwriting. It's too distinctive: "Whereas, before Karrer went mad, I used to go walking with Oehler only on Wednesdays, now I go walking--now that Karrer has gone mad--with Oehler on Monday as well." Continuing the theme of "lack of originality," there seems to be a new recommendation to undergraduates and other aspiring writers, having to do with "patchwriting:"
Rebecca Moore Howard defines “patchwriting” as a method of composing in which writers take the words of other authors and patch them together with few or no changes (233). * Although associated with plagiarism, it is an extremely useful writing strategy with a very long and noble tradition, and I hope that, by the end of this essay, you will be convinced that the opportunities (great writing) far outweigh the risks (accusations of dishonesty). Perhaps the risks are small, if one doesn't mind accusations of dishonesty. But what about punishment for dishonesty? Patchwriting passed off as one's own work is cheating and deserves to be punished severely. The author speaks of an "unshakeable moral dilemma" he had when first embarking on his project. I hope these words were not taken from another author because that would reveal lack of good taste in addition to a lack of honesty. Mind you, I have nothing against using "the words of others" in learning how to write for oneself. Painters often start by copying the work of others as well. But the perpetration of forgeries is not the ultimate goal here either. Someone might say that a collage can be a work of art. It can be, but if you produce a collage, clearly identify it as a collage. 1. See Composing the Anthology: An Exercise in Patchwriting. The "textbook" in which these claims are found is by one Christopher Leary. I sincerely hope that this is not going on in "composition" classes. 2. I read in one blog: "Leary’s struggle is easy to get past if we set aside the romantic notion that the individual inspired author imbues the content with value." Perhaps this is true, but it does not make patchwriting any better. In the classroom, at least, the student is supposed to demonstrate that she or he actually comprehends the material and can write. Still, Emerson also had a deeper and more important point: "Every common place we utter is a formula in which is packed up an uncounted list of particular observations. and every man's mind at this moment is a formula condensing the results of all his conclusions." He does not go quite far enough. It would be bad enough, if the "common places" were only our own conclusions, but they really are, in fact, for the most part the conclusions of others we unreflectively accept as our own: "the tune of the time," if we are lucky, a cacophony of different common places, if we are not. Whether 1834 was in this regard better than 2010 remains an open question. 1. Joel Porte, ed., Emerson in His Journals (Cambridge, MA: The Belknap Press of Harvard University, 1982), p. 127. 2. Emerson in His Journals, p. 124.